S.E. Nichols Discount City #18 in Maple Shade, N.J., the "Mighty 18" as it was called by the staff, which operated from October, 1964 to September, 1985. 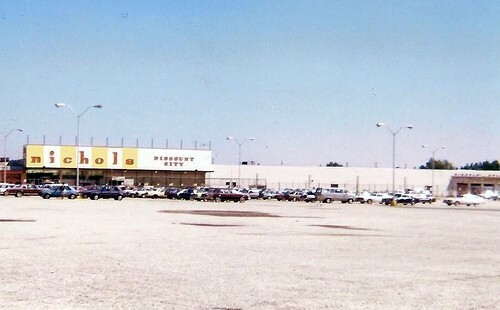 In 1978, it was one of the first Nichols stores to add a Home Improvement Center which is on the right side of this shot. After Nichols closed, the building housed a Cost Cutters store – which was like a large dollar/odd-lot store. It was demolished in 1990 and a Price Club warehouse-membership club store was built, replaced by a Caldor discount store in 1994. After enlarging the building it became Lowe’s in the early 2000s. If this Nichols did not close and survived long enough, it might have become PharmHouse – which was a discount drug and houseware store Nichols converted its stores into when they left the full-scale discount store field in 1990. It also probably would have lost its retro looking canopy as Nichols began an extensive remodeling program about the time this store closed and rolled out an upgraded image with a new stencil style font logo before changing to PharmHouse.